Pete Clark fiddler and member of the Benachally Ceilidh Band. Pete's home is in highland Perthshire, not far from where the great Scottish fiddler Niel Gow lived over two centuries ago. A former tutor at The Royal Conservatoire of Scotland in Glasgow, Pete keeps busy with performing, teaching, composing and recording. 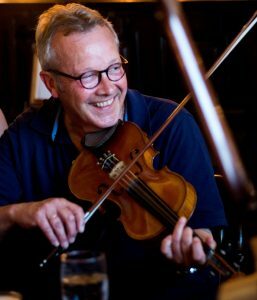 He directs his own biannual fiddle courses in the village of Birnam, coaches and conducts the Dunkeld & District Strathspey & Reel Society and is founder and director of the annual Niel Gow Festival, which earlier this year celebrated its 15th anniversary. Pete has previously taught and performed in many countries including the USA, Canada and Japan, and is visiting lecturer on the fiddle music of Scotland at the University of St Andrews. He is also a regular contributor to “Fiddler Magazine”, published quarterly in the USA. His ninth and most recent recording, “Niel Gow’s Fiddle” (released November 2017), features Pete playing the fiddle which once belonged to the 18th century Perthshire maestro Niel Gow. Profits from sales of this album will go towards the creation of a memorial to Gow (a life-size bronze) in the village of Dunkeld.